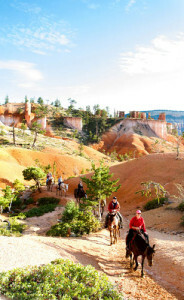 Traveling Scenic Byway 12 one can't help but notice that just beyond the hustle and bustle of Bryce Canyon City (formerly Ruby's Inn) the towns seem to be at rest in a much earlier time period. Time travel is alive and well on this road. There is a reason that the towns along Scenic Byway 12 are so well preserved to the delight of anyone looking for an authentic, unspoiled and peaceful place in the heart of wild Utah. Until 1975 the paved road ended at Boulder Town. Then the State Transportation Commission decided that paving the forest road across the east side of Boulder Mountain to Torrey was a great idea. Once so isolated from its neighbors that the mail was delivered by mule, Boulder became much easier to access when the road to Torrey opened. But in the years that have passed the towns along Highway 12 have remained unique, relatively isolated, and lightly populated. The first Native American tribes in the region understood the marginal resources here, particularly water, and the diverse and rugged landscape. These forces defined their ways and their population. These same forces continue to define the settlements and their populations which have remained relatively unchanged over time. Utah's Scenic Byway 12 is one of the most spectacular roads in the country. Its sensational scenery draws people from all over the world to journey through unforgettable terrain - and time. 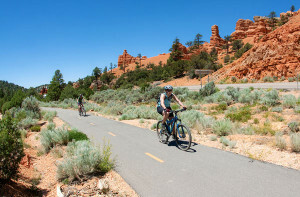 The Byway traverses the south central portion of the state, stretching 124 miles across a richly varied landscape through a remote and rugged region of southern Utah. Running southwest to northeast, the Byway 12 cuts through several ecosystems, from sage flats and ponderosa pine forests to slickrock desert and quaking aspen colonies. The road travels through landscapes that span elevations from 4,000 feet at the Escalante River to 10,000 feet under the rim of Boulder Mountain. 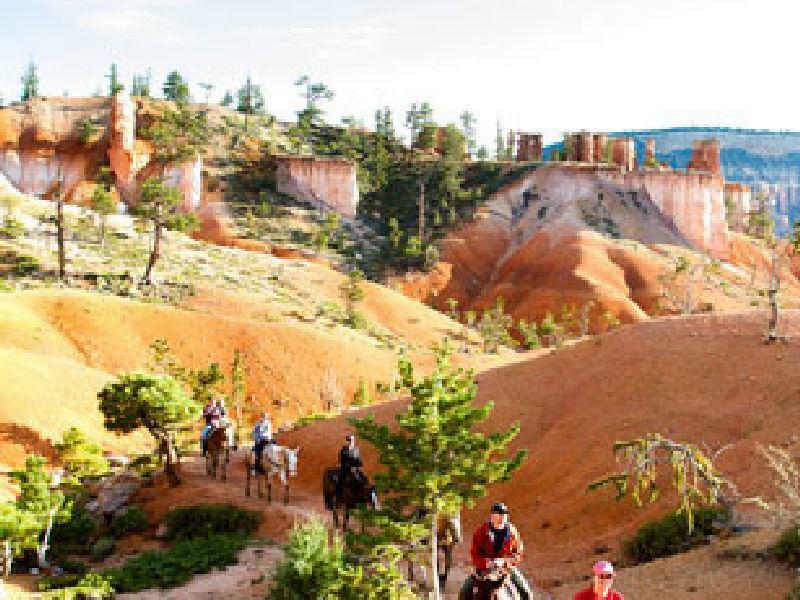 It lies between Bryce Canyon and Capitol Reef national parks and travels through Dixie National Forest and the northern part of Grand Staircase-Escalante National Monument. 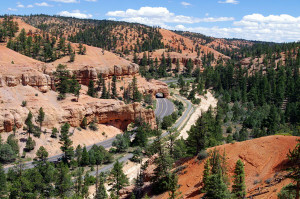 Designated as a National Forest Scenic Byway in 1988, State Scenic Byway designation followed in April of 1990. It was among the first state highways in Utah to gain this status. Then in early 2001, local stakeholders decided to plan for the future of this valuable resource and to consider pursuing All-American Road designation. 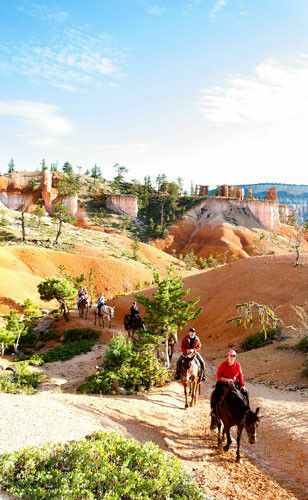 Travelers encounter archeological, cultural, historical, natural, recreational and scenic qualities while experiencing this unique and thrilling byway. These intrinsic qualities served as the basis for All-American Road designation bestowed upon the route in 2002 by the Federal Highways Administration (FHA). The historic and scenic characteristics of the road were highlighted in the Scenic Byway 12 Corridor Management Plan developed by area citizens, local governments and tourism and public land managers in 2001. The plan served as the primary document submitted to the FHA in the application for national designation. Scenic Byway 12 is truly the lifeblood of the region. It is the only principal through-highway that runs east of Panguitch and links U.S. 89 with S.R. 24. To some, the byway supports their very livelihood and to residents of the communities along the road it is the way to and from home. These communities are as diverse as the landscape they occupy. Panguitch is the largest gateway town with 1,500 residents. Cannonville is the smallest and home to 160 people. In all there are six towns on the road and each retains its own unique character. It was the residents of these tiny towns and a handful of transient miners, ranchers, trappers and loggers that expanded the original walking routes. These were first established by Native Americans and pioneers, later into narrow dirt lanes and finally graded roadways in order to expand commerce, improve safe travel, and open the region to visitors. The Civilian Conservation Corps finished the road to its current alignment in 1935 with extensive dynamite work and earth moving. Upon its opening it became known as the "Million Dollar Highway" reflecting the cost of construction at the time. By 1975 the entire length of Scenic Byway 12 was paved and open to travel for all. Opportunity for adventure abounds on Scenic Byway 12. The recreational resources accessible along the road and from its side-roads (Scenic Backways) offer a tantalizing and unique concentration of possibilities from serene to extreme. 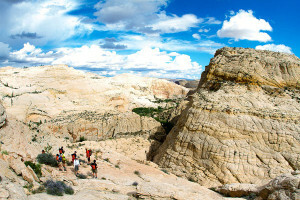 Choose your landscape and adventure - from high mountain lakes to vast slickrock mesas and canyons. You will not be disappointed. If windshield tourism is your thing, plan to spend 3 or 4 hours travelling the road (one-way) so you can stop and take in the many scenic and interpretive waysides and visitor centers along the road. If you are more hands-on, prepare and plan your trip carefully to spend at least 3 days getting into the backcountry to enjoy a first-hand experience. The visitor centers provide tremendous informational resource. For maximum fun consider hiring a local guide through one of the services in Bryce Valley, Escalante or Boulder. These services take you to the best locations with guides who are familiar with the country and the conditions. And...don't forget to reset your watch back to 2014 when you leave.